Holy crap… What a week. It all started about ten days ago when a technician at our hosting provider let it slip that there had been a pretty big managerial change at the company. Which would be fine I guess… had they let me know about the change through proper channels and in a more professional way. But it seemed like they were trying to keep me somehow sequestered from the truth and I got spooked. So, in less than 12 hours I made a list of perspective new hosts, interviewed all of them, and chose my favorite. The hard part was migrating each of my websites from the old host, where I had been for almost a decade, to the new host without causing too much of a problem for you guys. Thanks to the German (He came back to help me in a time of need… Pals.) and all of the great people at KnownHost, the transition went incredibly smooth. In fact, we were only down for about three hours. This passage into a new modern world of technology (holy crap our new servers are amazing) didn’t come without a cost though. In the past ten days, I’ve had 19 hours of sleep. Total. Presently, I’m a zombie. No really… There’s nothing between my ears at the moment. I’m incapable of processing even the simplest of commands and it’s a damned miracle that I’m even typing this right now. The only motivation I have is that sleep is finally just around the corner. Anyway… I just wanted to keep you guys abreast of the goings on at the Atomic Industry World Headquarters. And that’s that. But I can’t just post a bunch of misery and tech mumbo jumbo and call it content for the day. 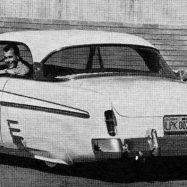 So, I present to you John Cox’s 1956 Mercury. This shot of John’s Merc is the only one that I have. I swiped it from Kustomrama this morning… But it’s a car I’ve thought about every single time I shoot a mid-century Mercury. The stance. The Chrysler trim. The Chrysler taillights. The Olds caps. The… Does a ’56 Mercury get any better? I don’t think it does… I just wish I had more shots of it. Editor’s Note: I’m a little behind on Alliance tag stamping due to the server change-over crap. However, I plan on stamping today and shipping tomorrow. So, stay tuned… and thanks for your patience.